Discover the prestigious wine region of Ribera del Duero from Madrid. Depart Madrid in the morning and after about two hours of you will reach the first winery in Ribera del Duero. Next visit the premises to learn the process of winemaking in this part of Spain. After a commented wine tasting, It is time to continue exploring the cellars of this land with the visit of the second winery, then , it is free time for a traditional lunch with more wines of Ribera. After lunch, visit a third winery, making different style wines and of course, taste them. And a last stop at the picturesque city of Segovia to have a scenic visit with free time before departing to Madrid. 10 hours to discover Ribera del Duero. The tour for a true wine lover. If you are fond of wines and want to discover one of the most prestigious wine areas of Spain, we invite you to come with us to Ribera del Duero. The excursion departs every day Monday to Saturday from Madrid. You will be picked up in Madrid at 9:15 am and depart towards Ribera del Duero. The Duero river, also known as the river of wine, is about 2 hours from Madrid and it is the home of tempranillo, the most famous Spanish grape variety (red wines with full body and lots of fruit). Visit three of their most representative wineries, modern and traditional, and their vineyards. You will do a full visit in one of them, learning about winemaking in Ribera (riverside in spanish), and understanding tempranillo wine from the grape to the bottle. A real immersion in the culture of wine. Also included a scenic stop at Segovia, with free time. First stop will be one of the most representative wineries in the region, where you will taste the freshness and elegance of their aged wines, feeling the extraordinary complexity of this land. 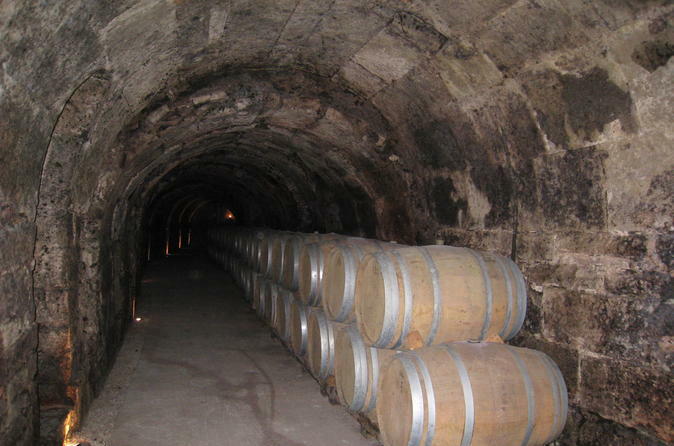 Two more wineries and cellars will be visited during the day. We always select wineries that are different, mixing tradition and modernity, to get a broad understanding of one of the most famous wine regions in the world. Every stop will bring a surprise, and you will learn about traditional wine making, modern architecture and limited productions that make special wines. Enjoy a scenic stop at the picturesque city of Segovia with free time before departing to Madrid. Finally you will return to Madrid with the memory full of great flavors and wonderful experiences. The duration of the tour is between 10 to 11 hours depending on Madrid traffic. This tour will bring you an exceptional experience, blending new and old wine making techniques, vineyards growing in extreme weather conditions, and the work of families who have converted this great region into one of the most popular red wine regions in the world. Let us accompany you among landscapes of contrasting colors, wines full of taste and aromas, traditional cuisine and the exceptional heritage which is still preserved in the wine region of Ribera del Duero.